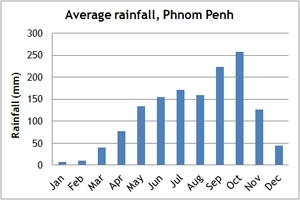 Our climate charts will give you a guide to the weather conditions in Cambodia. Cambodia is a year-round holiday destination, with warm temperatures throughout. 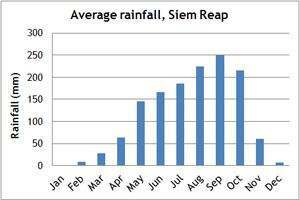 Between May and October is the monsoon season, but the rain tends to be in short sharp downpours, so it does not have to affect your holiday to Cambodia. The ideal months to travel are November to January. The waterfalls and rivers are full, the countryside is full of colour. 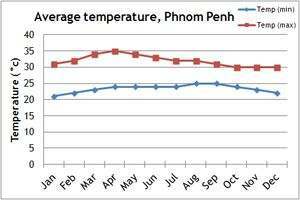 The climate tends to be dry and the humidity lower, but these months also see the most tourists. 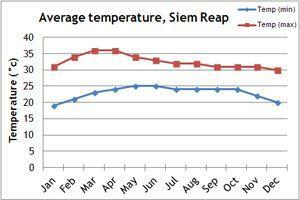 The temperatures then increase towards April, which usually sees the peak temperature. If you can't make the dates of our group departures, then take a private departure on dates to suit you, or we can create a Tailor Made holiday to Cambodia, especially for you and your family or friends. It is also possible to add an Angkor Wat extension in Cambodia, on to one of our other holidays in southeast Asia.